Digital reverb with analogue personality, from Waves. NAMM 2015: Vintage will meet modern in Waves' forthcoming VST/AU/RTAS/AAX plugin. 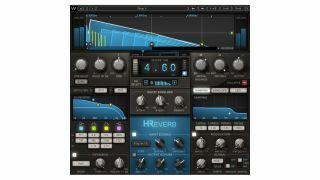 H-Reverb features convolution-style generation for the reverb signal itself, and emulates the warmth of analogue circuitry to handle other processes. Beneath the modern reverb response display, controls include Early Reflections/Tail balance, Dry/Wet mix, Damping, Envelope and LFO, complex decay controls, separate Input and Output echo controls, reverb EQ, Dynamics and Modulation. And this wouldn't be a Waves plugin without a swathe of contributions from professional engineers. We'll see who's been responsible for these in good time, though we're still not sure when H-Reverb will be released or how much it'll cost! Keep up to date via the Waves website.